Take a break from the city and head to Lone Pine Koala Sanctuary and Dicky Beach. The adventure continues: walk around South Bank Parklands, ponder the world of politics at City Hall, take some stellar pictures from Mount Coot-tha Lookout, and take in nature's colorful creations at City Botanic Gardens. For more things to do, reviews, ratings, and tourist information, you can read our Brisbane itinerary maker app . London, UK to Brisbane is an approximately 25-hour flight. You can also do a combination of flight and bus; or do a combination of flight, bus, and train. The time zone changes from Greenwich Mean Time to Australian Eastern Standard Time (Queensland), which is usually a 10 hour difference. 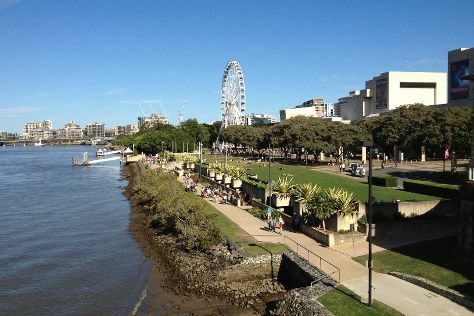 Traveling from London in February, expect Brisbane to be much hotter, temps between 33°C and 24°C. Wrap up your sightseeing on the 14th (Fri) early enough to drive to Gold Coast. Step out of the city life by going to Surfers Paradise Beach and Burleigh Heads Beach. We've included these beaches for you: Coolangatta Beach and Burleigh Head National Park. When in Gold Coast, make a side trip to see Watersports Guru in Kingscliff, approximately 46 minutes away. Next up on the itinerary: laugh and play at Sea World Theme Park, tee off at Surfers Paradise Golf Club, enjoy breathtaking views from SkyPoint Observation Deck, and get in on the family fun at Infinity Attraction. To see where to stay, ratings, photos, and tourist information, use the Gold Coast tour itinerary app . Getting from Brisbane to Gold Coast by car takes about an hour. Other options: take a bus; or take a train. Expect a daytime high around 32°C in February, and nighttime lows around 24°C. Wrap up your sightseeing on the 17th (Mon) early enough to travel to Sydney. Visit Manly Beach and Clovelly Beach for some beach relaxation. Take a break from the city and head to Bondi Beach and Wentworth Falls. You'll find plenty of places to visit near Sydney: The National Pass (in Blue Mountains National Park) and Shelly Beach (in Manly). Spend the 22nd (Sat) exploring nature at Sydney Harbour National Park. 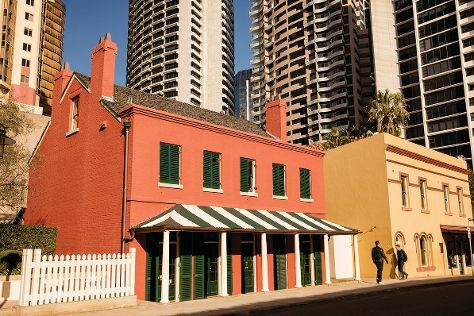 The adventure continues: get to know the fascinating history of The Rocks, take in the views from Sydney Harbour Bridge, admire nature's wide array of creatures at Sea Life Sydney Aquarium, and pause for some photo ops at Mrs Macquarie's Chair. For more things to do, ratings, photos, and tourist information, read Sydney day trip planner . Traveling by flight from Gold Coast to Sydney takes 3.5 hours. Alternatively, you can do a combination of train and flight; or drive. In February, daily temperatures in Sydney can reach 31°C, while at night they dip to 23°C. Finish up your sightseeing early on the 23rd (Sun) so you can travel to Melbourne. Get some historical perspective at Shrine of Remembrance and Old Safety Deposit Building. Get outdoors at The Great Ocean Road and Balloon Rides. Next up on the itinerary: admire the natural beauty at Royal Botanic Gardens, enjoy breathtaking views from Eureka Skydeck 88, enjoy the sand and surf at Half Moon Bay, and admire nature's wide array of creatures at Melbourne Zoo. To see reviews, more things to do, traveler tips, and other tourist information, go to the Melbourne trip builder app . Fly from Sydney to Melbourne in 3.5 hours. Alternatively, you can do a combination of flight and shuttle; or drive. Traveling from Sydney in February, you can expect nighttime temperatures to be a bit cooler in Melbourne, with lows of 16°C. On the 28th (Fri), you'll travel back home.